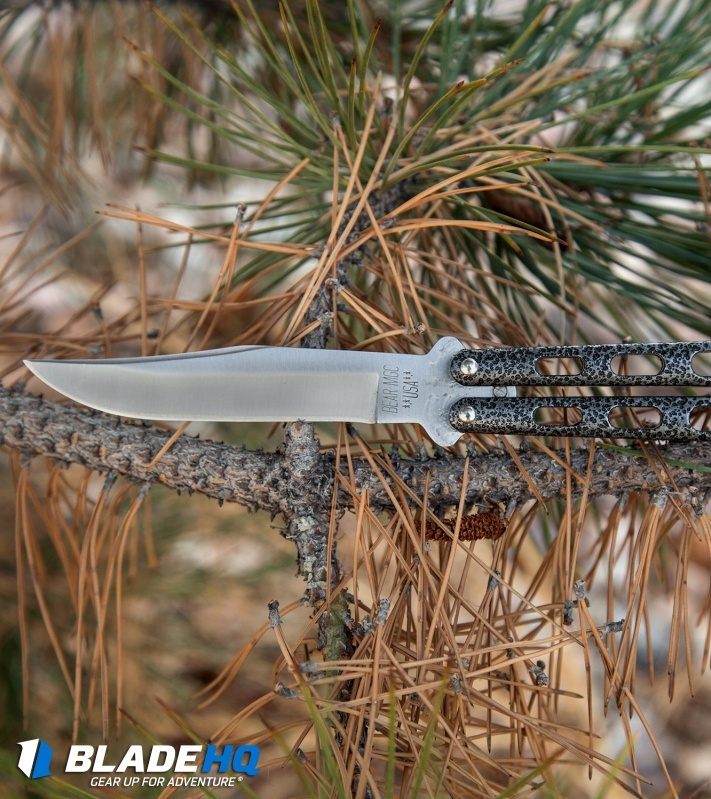 Bear Butterfly Knives may not be the most refined, but they are tough! This 114 model features a tough silver vein (textured silver paint over a black base) epoxy coating over the handles. The handles feature a skeletonized design to reduce weight. The stainless steel blade is satin finished with a plain edge. Single tang pin. A nice mid-range butterfly knife and made in the USA! The latch gets in the way of the nlade and it nicks it,but thats not my problem,the handles are way too tight,I can't flip the night cause of it,it only has one tang pin but that doesn't change the fact that it is a basic and nice Bali for the price. Bought this knife on 2-16-2016, flipped it every day and used it religiously at work for cutting straps, boxes, etc. It's been dropped, banged, chipped, and abused like a Parisian lady of the night. 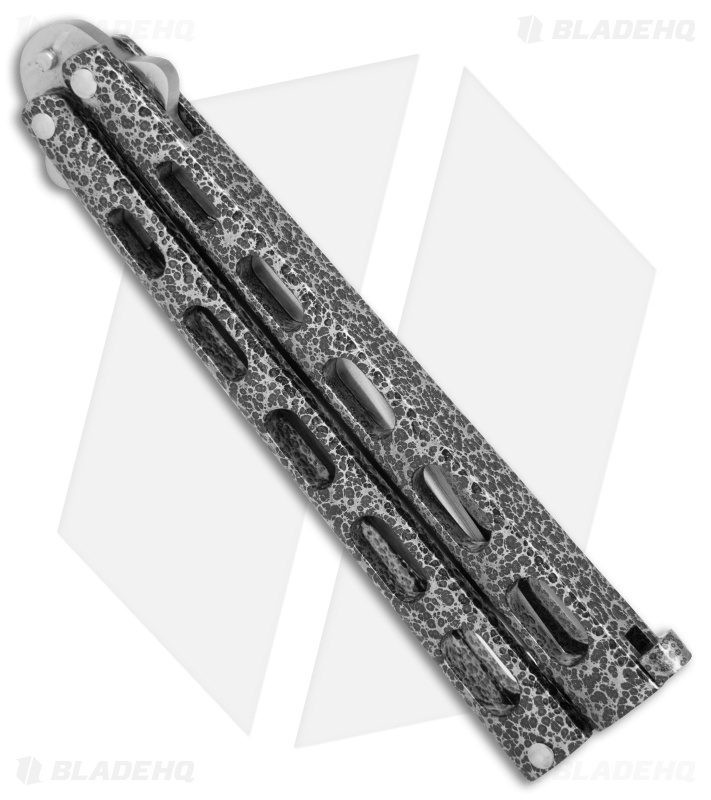 Like other reviewers have mentioned the latch often gets in the way of the blade and both will chip, however the blade wins this fight and it isn't hard to hone a new edge on. Be aware that without spacers the soft aluminum handle may bend inward and not allow the latch to close, but a little careful effort with a pry bar can straighten and true the handles again. 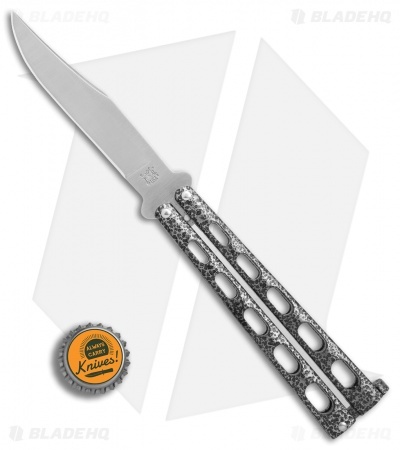 This was my 1st butterfly and i learned a good assortment of tricks on it, but eventually after nearly 2 years of daily flipping the aluminum safe handle developed a metal fatigued crack where the tang ping strikes it and it broke off from simply opening it one too many times. It broke 2-7-18. For what i payed and the quality i received with 2 years of service i rate this knife at 8/10 would buy again! Best work knife ever (as of this writing, buying upgrade XD). I've been heavily flipping this knife for a little over a month now, I've dropped it on tile and carpet a bunch of times and all thats happened is the pivot pins have gotten a bit loose. This is a good starter balisong but that being said there's a LOT keeping this from being better than just ok. The pins aren't adjustable (which is a major down side), the blade dulls pretty fast and seems to scratch and chip easily, and the latch doesn't have a guard to keep the blade from hitting it meaning the latch and the blade will chip. Also my knife is fairly new and I already see rust spots on the blade even though I've kept it completely dry. I've also noticed some dents on the handle from where the little metal stopper hits the handles. 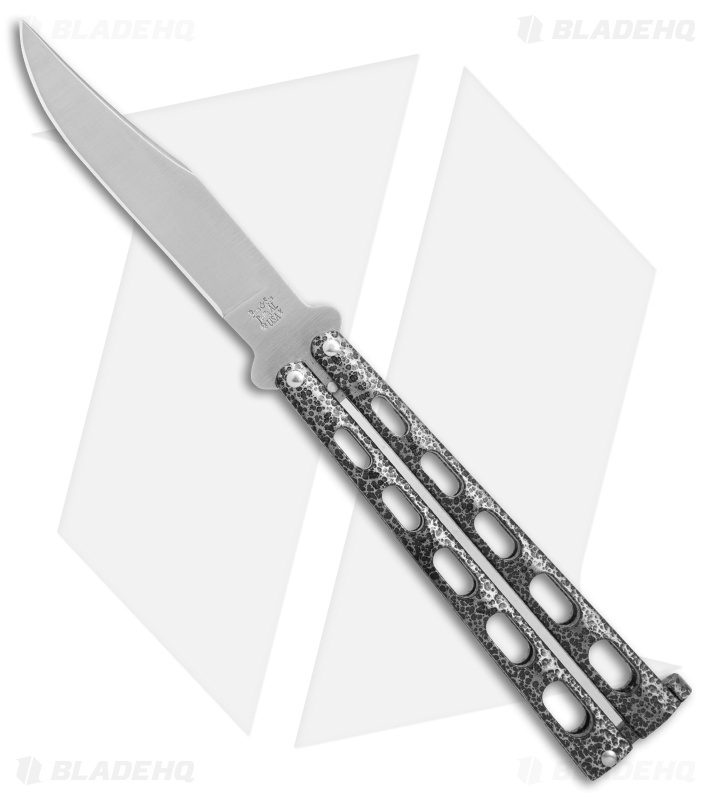 All things taken into consideration if you're new to balis or just want a cheap one that wont crap out on you I strongly recommend this knife. Awesome knife for the price point. Blade hq shipped super fast! Out of the box it came well oiled and flips super smooth my on complaint is the edge wasn't as good as it could be but nothing that can't be fixed with a medium and fine grit stones. Overall great buy, would highly recommend! I loved how smooth the action was and how little play there was in the handles. I learned quite a few beginner, intermediate and advanced skills. However, after about 6-7 months of use it began to get loose. I'm not sure if it's the volume of use or the falls whilst learning rollovers and chaplains. I always practiced over my bed or carpet, so it shouldn't have been too damaging. But the looser it got, the less control I had to the point where I had very little control over the action, was getting cut and retired the knife from use. If there is a way to tighten the blade, I'd love to hear it - but there does not appear to be a way of doing that. 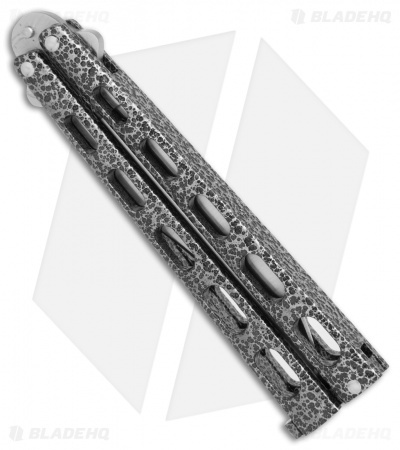 This is a great starter balisong. I love to flip it, it is really good. Definitely worth the money. 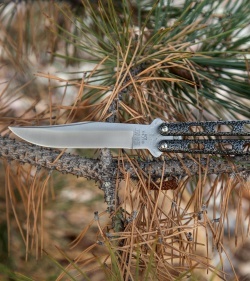 This was my first balisong. I heard to stay away from the cheaper balisongs but I've own this thing for over a year now and it has held up pretty well. It's still in good shape. I've heard about them breaking easily. But from my experience with Bear & Son/Bear OPS, their QA department is hit or miss. I also own a Bear OPS B200 and that thing is a mess, even right out of the box! 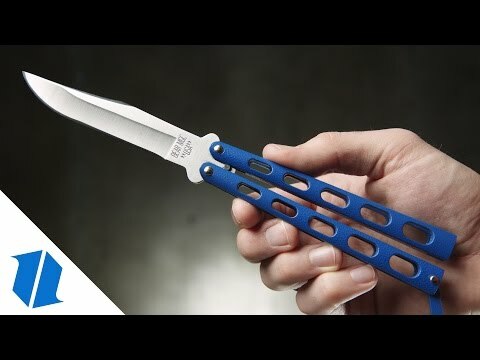 Love this knife easy ft me to flip (because I have small hands) and feels like it's not some cheap knife awesome looking and feeling love the blade! Also I like how the joint where already oiled for me. Now I'm new to butterfly knifes but I know this is a great deal only 27.99 plus shipping and handling is a great deal!